Three American NGOs involved in the Tamilnadu’s “Kudankulam” power station protests have been deprived of their licenses, and one more is under investigation, Indian Minister of State Narayanasamy says. 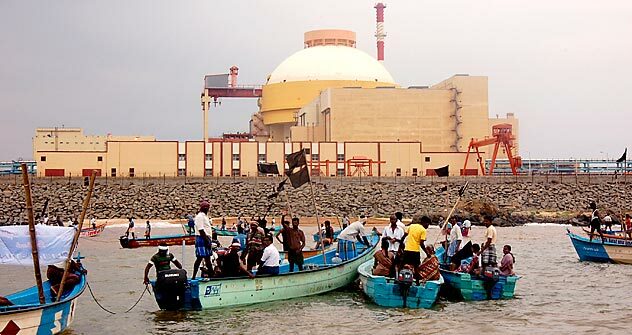 Investigation into the situation confirmed involvement of some NGOs in the protest actions at the nuclear power station “Kudankulam”, which is being constructed in the South Indian state of Tamilnadu with the help of Russia, according to Mr. NarayanasamyMinister of State in the Prime Minister’s administration. According to Narayanasamy, three NGOs are already deprived of their licenses, and one more is under investigation. It has been found out that those organisations have been financed by the USA and the Scandinavian countries. Earlier on Friday, Indian Prime Minister Manmohan Singh said that American NGOs are behind the “Kudankulam” protests. Manmohan Singh said in his interview to the Science magazine that the US-based NGOs don’t appreciate India’s needs to increase its energy production. People’s Movement Against Nuclear Energy (PMANE) doesn’t acknowledge any US organisations’ or funding of the movement. Head of the movement Udaya Kumar claims the purity of the protests. The Indian journalist P. Sunderarajan Sandeep Dikshit elaborates in his article in The Hindu on the impact of Kudankulam protests on Indo-Russian collaboration in building the nuclear power plant, saying that India appreciated Moscow’s patience. According to the Hindu newspaper, at ‘Comprehensive Foreign Office Consultations,' Foreign Secretary Ranjan Mathai told Russia's First Deputy Foreign Minister Andrei Denisov on Thursday that India was consulting various domestic constituencies and working on the opening of the first 1,000 MW unit, a process that would pave the way for operationalising the second unit six months later. Launch of the first unit of the nuclear power station “Kudankulam” was timed to the end of 2011. The reasons for delay were non-stopping protests of local residents who oppose using nuclear energy and demand to cancel launching of the power station. In mid-October the crowds of protesters blocked the road leading to “Kudankulam” and they don’t let engineers and builders finish the construction works up to now. The nuclear power plant “Kudankulam” is being constructed in India in the framework of the agreement concluded on November 20 1988 and the annex to the document of 21 June 1998. The ordering customer is the Indian corporation on nuclear energy. In 2002 building of the first two power units began under the management of the Russian company “Atomstroiexport”. During the first stage of construction works two power units were built with reactors VVER-1000 with total power of 2,000-MW.